The X is for extreme. Dude? Updated The mobile world is fast on the heels of the laptop world. Qualcomm, the designer of Snapdragon processors primarily for smartphones and tablets, today teased the 8CX: a fanless 64-bit Arm-compatible 7nm system-on-chip for notebooks. The Snapdragon 8CX follows on from the 10nm SD845 and SD850, which were both aimed at Windows 10 laptops, so-called "always connected mobile PCs" because they feature cellular network connectivity and Wi-Fi to always be tethered to the internet. As for the name, we guess the C is for compute and the X is for extreme. Qualcomm has the SD855 for top-end 5G phones, it's moved on from the data-center-grade Centriq debacle, and now it's touting the 8CX for future internet-reliant, light, thin, and fanless Arm-based Windows 10 laptops. It runs Windows 10 Enterprise as well as Home and Pro, plus Office 365. It's worth noting that right now, Microsoft is focused on supporting Windows 10 on Qualcomm chipsets for Arm-based laptops; non-Qualy system-on-chip families may be supported in future. The 845 and the 850 were mainly aimed at early adopters of Win10 Arm laptops in that the notebooks weren't perfect: performance was about good enough for day-to-day desktop use, but the machines were expensive, for one thing. The 8CX is supposed to attract more mainstream users by operating more like an x86 Intel or AMD laptop processor albeit with multi-day battery life. By multi-day, Qualcomm and Microsoft reckon you should be able to use the thing for work and Netflix bingeing for several hours a day, over the course of a few days, between charges. This hardware is really aimed at people who aren't near, or don't want to be near, a charging point for much of their day, and want to be able to switch between Wi-Fi and cellular broadband on the go. Mobile millennials. That sort of thing. We're told the 8CX is 3.5 times faster than the 835, and 60 per cent more efficient than the 850 in terms of power usage. Devices powered by the 8CX are due to go on sale in the third quarter of 2019. Samples of the processor are in manufacturers' hands right now, we're told. Interestingly enough, PC makers will still tout laptops powered by the Snapdragon 850, apparently. The 8CX is for top-tier Arm-based portable computers. Open-source Chromium and Firefox browsers have also been ported to the chipset, we're told, if you want an alternative to Microsoft's offerings. The machines can run x86 applications under emulation, if needed, although Microsoft is encouraging developers to produce Arm64 builds of their software. This new system-on-chip has eight 64-bit Armv8.1 CPU cores: four based on Arm Cortex-A76 designs, and four based on the Cortex-A55 with 10MB of total on-chip cache, which is more than previous generations. They are arranged in a unit dubbed the Kryo 495, and operate like Arm's Big.LITTLE architecture: the smaller A55's mostly running your apps and operating system, and the larger, beefier and more power hungry A76 cores spinning up to temporarily take on intensive workloads. 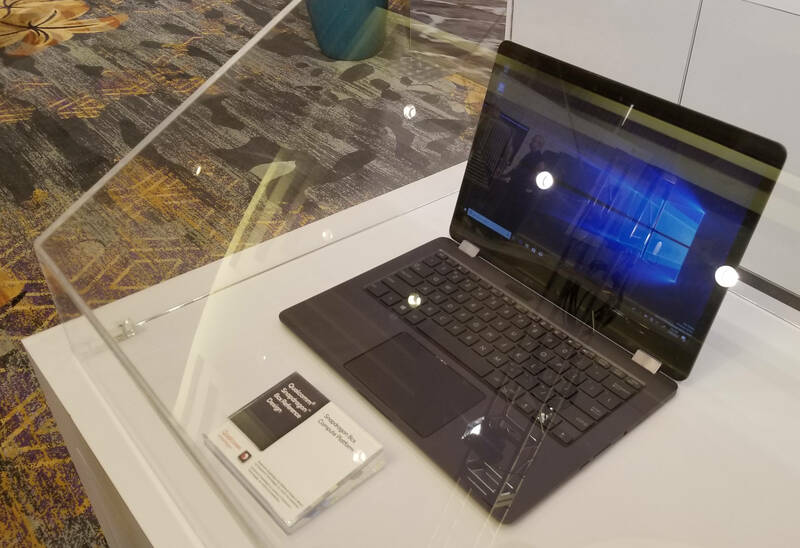 Qualcomm didn't disclose any clock speeds, though one prototype 8CX-powered laptop we briefly got our hands on reported it was clocked at 2.75GHz, similar to the 855, which runs up to 2.8GHz. Final production speeds may vary. The machines seemed to be as responsive as you'd expect an eight-core 2GHz+ Windows 10 PC to be. More testing will likely highlight the strong and weak points of the hardware. There's no 5G right now – that's coming later next year, apparently – so instead for now there's 4G/LTE Cat 50 connectivity via its Snapdragon X24 cellular modem, which can download up to 2Gbps over the air. It also has 802.11ad, 802.11ac Wave 2, 802.11a/b/g, and 802.11n Wi-Fi support built-in, running in the 2.4, 5, and 60GHz ranges. For graphics, there's an Adreno 860 GPU that supports Vulkan 1.1 and DirectX 12 and can drive one 4K display and up to two external 4K HDR monitors. There's also hardware units for decoding VP9 and H.265 video. The chip also provides USB 3.1, via type-C connectors, and PCIe 3.0 interfaces, and talks to up to 16GB of 2133MHz LPDDR4x RAM over eight channels with a 128-bit-wide memory interface (eight 16-bit channels, basically). It's also able to work with NVMe SSDs and Universal Flash Storage (UFS) 3.0. Qualcomm reckons its 8CX outperforms the competition, in terms of processor oomph, when consuming seven watts. The SoC also sports a Hexagon 690 DSP that performs various vector math and machine-learning acceleration in hardware. The 8CX was revealed today at Qualcomm's Snapdragon Tech Summit in Hawaii. You can get an 8CX product brief, here [PDF].